Seddon Park, Hamilton, New Zealand. An oustanding 239-run partnership from JP Duminy and David Miller gave the Saffari's a thrilling victory as they rallied against a courageous Zimbabwe. Zimbabwe won the toss and elected to bowl on a track that would surely benefit the bowlers. Hashim Amla and Quinton de Kock opened things for the South Africans, but after 4 overs it would be the Zimbabwe players who were marvelling in jubilation. After a maiden over to start things, Quinton de Kock hit the ball straight into the hands of Ervine, placed at extra cover. With South Africa looking rather sluggish, Zimbabwe pounced on an opportunity to dismiss the other half of the opening duo, as Amla would make his way to the pavilion in the 9th over. Panyangara sent the ball far, with Amla getting an edge on it clipping it towards the bails. It was the perfect start. South Africans were crossing their fingers in the hope that AB de Villiers would revive their chances as he joined du Plessis in the crease. They would be reduced to collecting a few singles and doubles as Chigumbura and Mire continued to push the pace with their bowling display. It took some 15 overs for South Africa to limp past the 50-run mark, and even after they did, they would be dealt another blow as du Plessis made his way out at the hands of Chigumbura's delivery. Soon after, further hopes were dashed when AB de Villers—their biggest hope—crashed out as he raced down the wicket to hit Kamungozi's delivery, but it went in to Ervine's hands. 21 overs and South Africa were in dire straits at 84/4. That would be the last wicket South Africa would concede. The heroics of Miller and Duminy took some time to work through the gears but when they did, South Africa had been revived. They had half an innings to turn the game around. They continued to follow a sensible approach and trying to find some patches in the field, but they couldn;t, at least in the early stages. Things were still tight, but the partnership being built was critical. By 35 overs, they had revived it from 84/4 to 151/4—and that would not even be half their final score. South Africa utilised the batting powerplay to their advantage, as Miller launched Panyangara for six and then subsequently locked down his first half-century in World Cup cricket. Miller and Duminy were swinging for the fences, and Duminy's half-century would soon follow. In the 41st over, they both got a six each. Panyangara thought he slowed things down with a quiet 44th over, but in the remaining 6, fireworks would go off in Hamilton. In the final over, Duminy completed a hundred, and after 50 overs, a 256-run partnership had put the game well in the favour of South Africa. 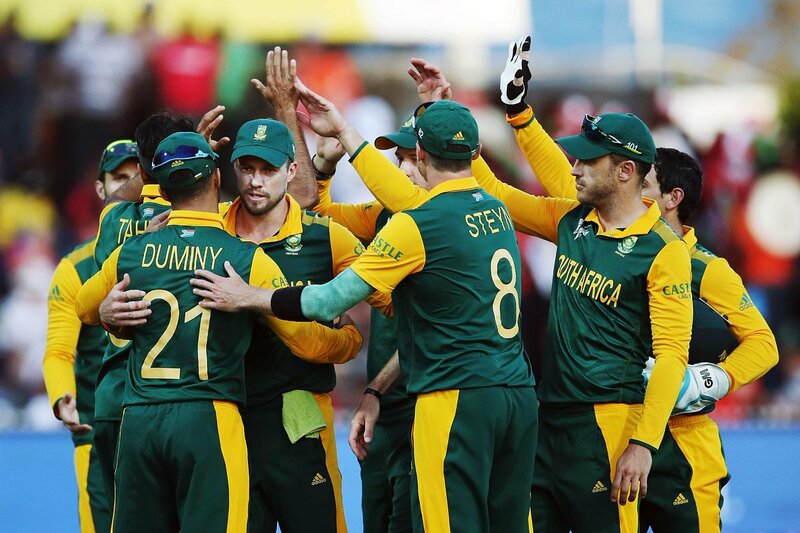 Zimbabwe didn't know what hit them, Miller and Duminy found momentum and that was that. 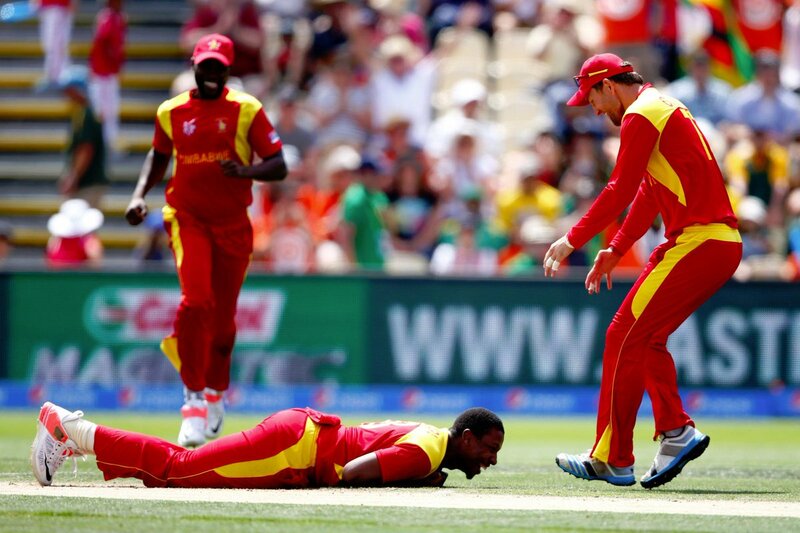 Zimbabwe had a clean slate to work on and quickly raced to 32 from the first 5 overs. But, the first piece to the puzzle would slip as Philander bouled out Sikandar Raza. He played the ball onto the stumps to give them an even bigger advantage in the contest. Zimbabwe were hardly fearful though. Not backing down, Chibhabha went full throttle against Dale Steyn, before a huge 15th and 16th over spell saw Zimbabwe pick up the space with a 19 run boost. Chibhaba, the opener, continued to gather momentum and reached the 50-run mark in the 20th over. A courageous display made the South African bowling look mediocre at best, before Chibhaba felt the full wrath of them. Imran Tahir struck and the ball was caught by Duminy to set it to 161/2. Another wicket by Imran Tahir would hugely shift the momentum in the game. Imran Tahir eliminated Masakaza, while Taylor was hitting more big shots for the African rivals. Taylor would then be out in the 38th over, it was crumbling. 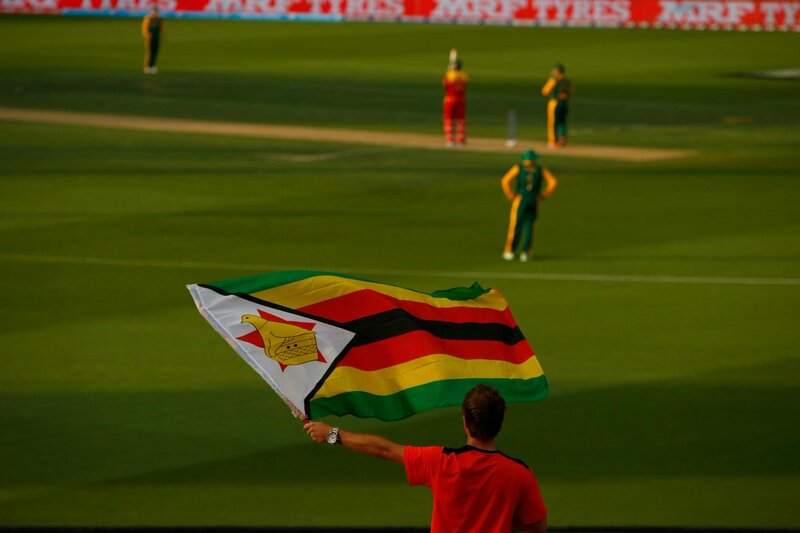 Moments later, Zimbabwe were reduced to 220/5 as Duminy got the better of Williams. Chigumbura and Ervine were now holding the front and a statement of intent with two sixes put in for some late nerves. That was until 2 overs later, Chigumbura was run out as they needed 102 runs in 48 balls. Dale Steyn would find some sucess as the fast-pacer picked out Ervine with a short-ball helped out by a terrific catch by de Villiers. Two overs later, Panyangara would be the 8th wicket to fall, another catch by de Villers off Tahir's 3rd wicket. AB de Villiers caught again, this time as Philander bowled Mire, and Morkel would pick up the final wicket, catching his own ball as Chatara hit it straight at him. A really well-contested game of cricket. Going into the encounter in Hamilton, New Zealand, all eyes were on the star that is AB de Villers. While he made a few terrific catches as Zimbabwe crumbled, an amazing partnership by Miller and Duminy would define the game. 256 runs between the two with both collecting centuries may be the standout performances of this tournament. Miller's sixes on abundance were sublime, Duminy followed suit and South Africa showed why they can definitely win the tournament, dispatching the gutsy display of Zimbabwe. South Africa march on to dispatch the courageous Zimbabweans in a thrilling display in New Zealand. England: Three Lions in jeopardy? South Africa edge New Zealand as Miller and Duminy put up big numbers in Hamilton, New Zealand.